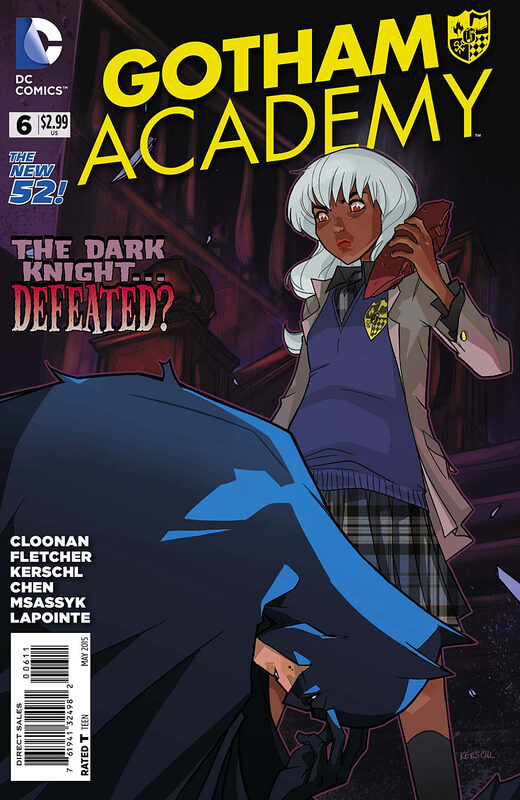 Its time to talk about Gotham Academy again. Lets get right to spoilery bit from the most recent issues. As I suspected there are no real ghosts or magical stuff going on at Gotham Academy. They played with it a little but in #4 reveal that the ghost is just a puppet operated by a boy trying to get his girlfriend to stop trying to summon ghosts. And at the end of that issue we learn that the “monster” in the walls of the school is actually Killer Croc who recently escaped from Arkham Asylum again. It turns out that Olive Silverlock’s mother was indeed an inmate at Arkham and Croc knew her. Apparently Croc promised to keep an eye on Olive but none of that changes that he is a grown man living in the walls of girls dormitory and occasionally peaking through holes in the wall. Then Maps comes along and Croc runs off afraid of being sent back to Arkham. Now I get that no one enjoys going to Arkham Asylum but I wonder if Killer Croc’s fear might be an indication that there are extra unpleasant things happening there right now. We also learn that the red eyed boy is not magic, he is in fact a man-bat. I know the original Man-bat once accidentally turned his wife into a Woman-bat but now it seems being a man-bat is a transmittable syndrome and this boy has it. It turns out he rescued Olive from a burning building last year during the mysterious incident that sent Olive’s mother to Arkham. Olive and the other kids want to go looking for Croc and they use a school dance as a cover where they wear some very expensive looking dresses. When they find Croc he actually seems like a pretty nice guy. Then Batman shows up. 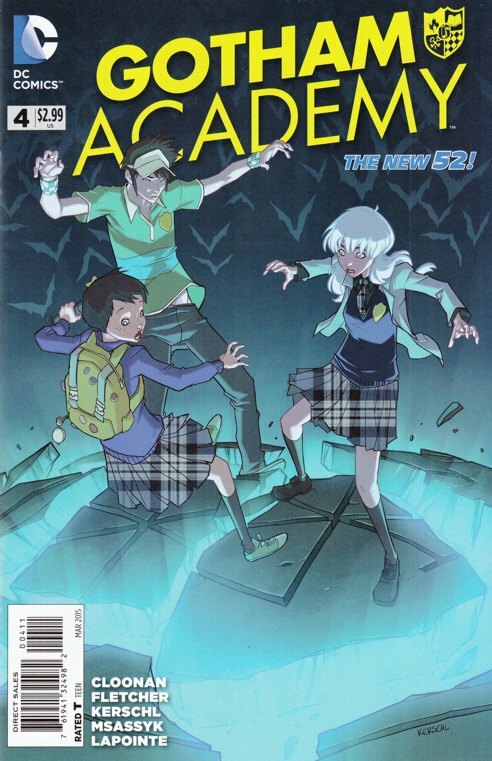 I wondered when Batman would make an official appearance in the pages of Gotham Academy. He arrives to take Killer Croc back to Arkham but Olive distracts him by starting a fire of all things and Croc rescues her then disappears back into the sewers. From Olive’s point of view Batman is a bad guy who took her mom away and Killer Croc is just a guy who knew her mom. Batman insists that Arkham is the best place for Olive’s mother and that someday she will understand that. It will probably be some time before that happens. We still don’t know the whole story about who Olive’s mother was or what she did and I get the impression that Olive may be somewhat in denial about it. Was her mother indeed some kind of super villain? The first story arc of the series has more or less come to a conclusion with Olive and Maps making a detective club. Olive’s mom is still gone and she still has a lot of unanswered questions but at least she has her friends she can count on. There is a little epilogue where we see that Damien Wayne will be joining the cast. I wonder how he will handle interacting with regular kids his age. Oh and apparently the school headmaster is himself a costumed crime fighter who protects the campus during the Endgame event. 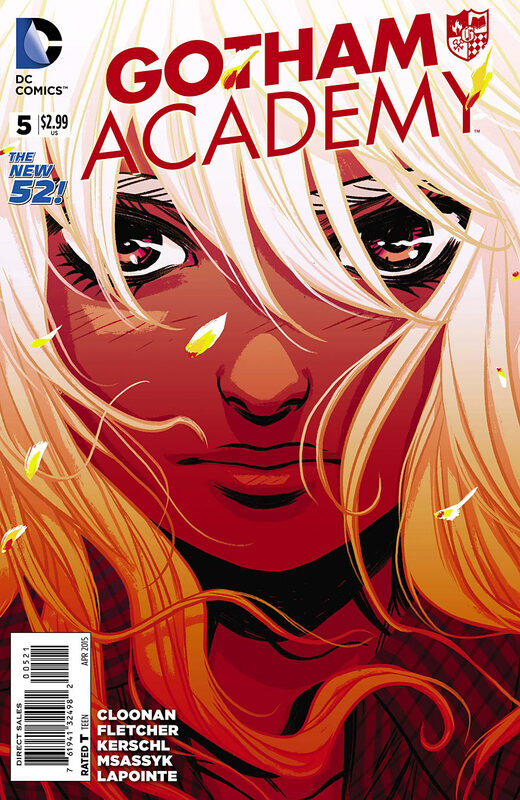 I still recommend Gotham Academy as one of the few titles out there that is indeed all ages appropriate.